The wait is finally over. Taiko no Tatsujin, the acclaimed Japanese rhythm game featuring many little drums who could, has finally had a localisation on both Nintendo Switch and PlayStation 4. Unfortunately, there wasn’t a drum kit included with this particular copy, but pretty much everything else functions just as expected, and the long and short of it is that Taiko no Tatsujin is pretty bloody great. It’s got absolutely everything you could want from a conventional rhythm game, along with one key aspect - it’s also brilliant in multiplayer. The Switch is home to many a rhythm game already, and all of them are spectacular. There’s Deemo, Voez, and the also-recently released Pianista, just to name a few. 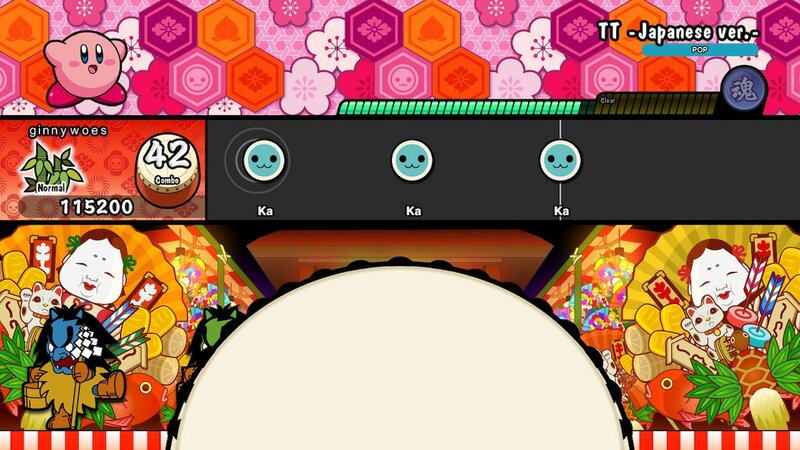 A lot of those rhythm game titles also simulate the experience of playing an instrument to some extent, though none as literal about this interpretation as Taiko no Tatsujin. 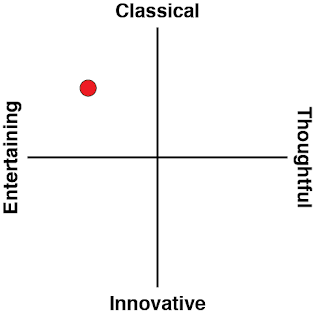 Where this fun-loving, happy-go-lucky game sets itself apart from its genre brethren is in sheer, tonal variety. The thing that’s most apparent from the minute that you boot up the game is the fact that Taiko is probably the purest game to make its way onto the eShop. One way to conceptualise the game is as a title about keeping a small, anthropomorphic, musically-inspired creature happy. You pick an avatar that basically dances along as you beat out a rhythm in time with music that’s playing in the background. The better you do, the more animated that creature becomes, and each particular one has its own abilities that make drumming easier in some way. For example, the Splatoon squid avatar wiggles around very adorably and also makes it easier for you to build up your special gauge that gives you more points. 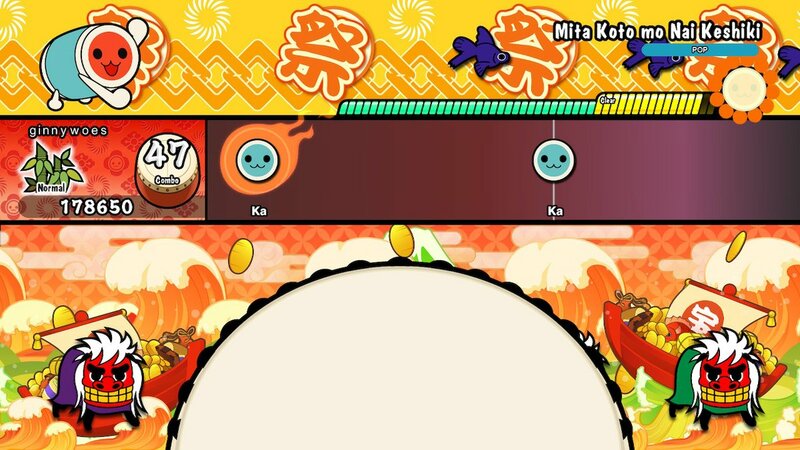 Other avatars that resemble drums are also available, and do a bunch of things ranging from relaxing the timing around hitting the right beats to only allowing for perfect hits, therefore making the game harder. The controls in handheld and Joy-con mode work mostly seamlessly, and it’s a credit to the developers that they’ve managed to make full use of all the Switch’s functionality – playing in any mode doesn’t feel like a compromised experience, which is a glowing compliment considering they’ve had to translate the game from an arcade cabinet setting. It’s a very different sort of experience to the other rhythm games on the Switch – your performance is directly reflected by the graphic elements on the screen becoming more boisterous and colourful. Flora and fauna of all sorts bound across the screen, from tigers to squid to flower petals and other things of a cute bent. While visual feedback on your performance isn’t anything new for a rhythm game, they usually come at you from a perspective that focuses on how you’ve underperformed in some way. Think about some common indicators, like dramatic graphics for breaking a streak, a giant “Miss” superimposed on your screen, or just the visually un-satisfying effect of greying out notes. 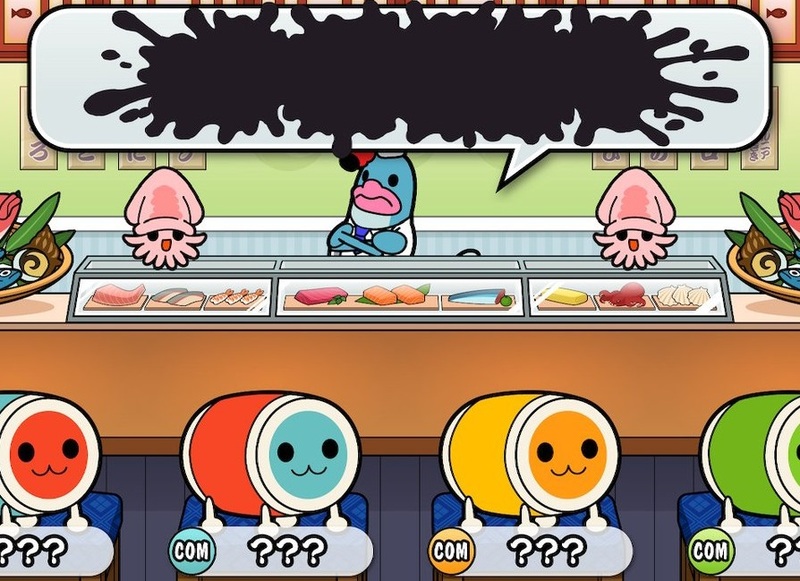 Taiko no Tatsujin has a decidedly positive focus by dialing up the rainbows and puppies when you’re doing well instead of turning everything sepia toned when you’re not, and that makes a lot of difference to those trying to crack the mental performance wall on tracks of Extreme difficulty. You can unlock those adorable, congratulatory avatars by playing through the game, which is also how it works with the game’s song library. There is a significant amount of variety within the title when it comes to songs that you initially start out with, so it’s not a matter of having to grind out the same 15 tunes over and over again before you actually get anywhere. Unfortunately, it’s hard to actually guess at what criteria you have to meet to unlock certain avatars or songs; Taiko no Tatsujin isn’t exactly forthcoming with that information, even though it has its own internal achievement system which notifies you after the fact. While Voez has a similar unlock system with its user avatars, those don’t actually affect the in-game mechanics at all, so it feels less like gating music behind a potential skill wall than what happens in Taiko. 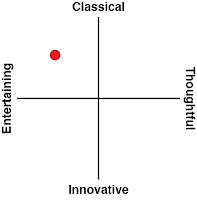 That being said, the music that you get without any need for achievements other than just regular playing of the game is more than sufficient. The soundtrack is obviously mostly Japanese music – the scale slides between J-pop, anime tunes, Japanese covers of international pop music, with a bit of classical and Vocaloid music thrown in for diversity. There’s the added bonus of Nintendo music on the Switch version, with the hit from Super Mario Odyssey making an appearance as well as a Splatoon medley. There’s a lot offered here and there will be a tune that takes everyone’s fancy in the grab bag offered by Taiko no Tatsujin, which is one of the hallmarks of a great rhythm game. On top of that, there’s also the multiplayer aspect to consider in the game, which is a novel feature compared to the offerings of the other rhythm games currently available on the Switch eShop. 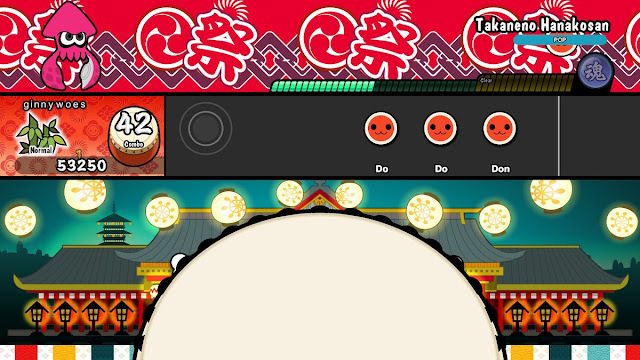 Rhythm games are often seen as a strictly single-player endeavour where you’re trying to best your own personal scores on a track, but Taiko no Tatsujin turns that on its head a bit by having a myriad of rhythm-based multiplayer modes to enjoy. The arcade version allowed you to drum along with a friend on certain tracks, which is still an option here. However, the Switch version takes it one step further by having modes that function as minigames, where players (or CPU characters) take on challenges involving drumming to a beat in nontraditional settings. Imagine the regular Taiko track screen being replaced with a game of pounding mochi, or hitting baseballs back at a fire-breathing feline. That’s just a few of the many shenanigans that you can get up to with friends in Taiko, and while the multiplayer clearly functions as a Take a Break mode, that doesn’t make it any less fun or fully-featured. Taiko no Tatsujin has a lot to offer on the Switch. For those who have played it on other consoles, there’ll be a slight difference in the tracklist, and of course, the added bonus of different Nintendo franchise avatars. It very much feels like a scaled-down version of the arcade cabinet which hasn’t lost any shine or pizazz in the port, and that is pretty incredible in itself. If you’re after a rhythm game that’s heartwarming, bold, and a hell of a lot of fun to play at parties, then you don’t have to look any further than this latest offering. This is one title that will bridge the gap between experienced rhythm game players and those with a more casual interest, and it’ll do so without sacrificing enjoyment for either.